The readings for this Sunday give us courage to not be afraid in the face of persecution or the scorn of others because of our faith. There is nothing they can do to hurt us. In our first reading (Jeremiah 20:10-13), we hear one of the laments of the prophet Jeremiah, who was continuously persecuted for speaking the truth of God. Despite the "terror on every side", he remained steadfast in his faith in God. Jeremiah said: "I hear the whisperings of many: 'Terror on every side! Denounce! let us denounce him!' All those who were my friends are on the watch for any misstep of mine. 'Perhaps he will be trapped; then we can prevail, and take our vengeance on him.' But the LORD is with me, like a mighty champion: my persecutors will stumble, they will not triumph. In their failure they will be put to utter shame, to lasting, unforgettable confusion. O LORD of hosts, you who test the just, who probe mind and heart, let me witness the vengeance you take on them, for to you I have entrusted my cause. Sing to the LORD, praise the LORD, for he has rescued the life of the poor from the power of the wicked!" In our Gospel reading (Matthew 10:26-33), we hear Jesus preparing his apostles for the persecutions they would experience as he commissioned them to go to the "lost sheep of Israel" to "proclaim that the Kingdom of God is at hand." Jesus said to the Twelve: "Fear no one. Nothing is concealed that will not be revealed, nor secret that will not be known. What I say to you in the darkness, speak in the light; what you hear whispered, proclaim on the housetops. And do not be afraid of those who kill the body but cannot kill the soul; rather, be afraid of the one who can destroy both soul and body in Gehenna. 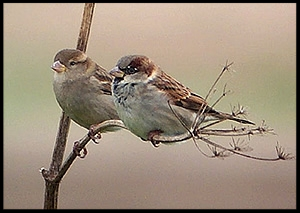 Are not two sparrows sold for a small coin? Yet not one of them falls to the ground without your Father's knowledge. Even all the hairs of your head are counted. So do not be afraid; you are worth more than many sparrows. Everyone who acknowledges me before others I will acknowledge before my heavenly Father. But whoever denies me before others, I will deny before my heavenly Father." In our Epistle reading (Romans 5:12-15), St. Paul compares and contrasts the role of the old Adam with that of the new Adam (Jesus) . One brought sin and death while the other brought life and salvation. Brothers and sisters: Through one man sin entered the world, and through sin, death, and thus death came to all men, inasmuch as all sinned -- for up to the time of the law, sin was in the world, though sin is not accounted when there is no law. But death reigned from Adam to Moses, even over those who did not sin after the pattern of the trespass of Adam, who is the type of the one who was to come. In many ways, we too are called to be prophets, to speak God's truth to the world. And in so doing, we may also suffer persecutions, scorn or ridicule. We should take comfort in knowing, God has our back - so much more so than the sparrow.